For my coffee maker of choice, I use a toddy cold brew system to make my coffee everyday. I have tried other coffee makers in the past but I have now found a coffee maker that would make the coffee of my preference. 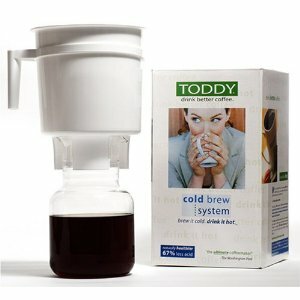 Then a friend of mine gave me a toddy cold brew system, and I instantly loved it. I also use my trusty old electric coffee grinder for making the coffee concentrate needed for my cold brew system. Then I just do the regular procedure in making cold brew to have the perfect cup of coffee. It takes a long time, but cold brew system is the perfect coffee maker for me. Join in and write your own page! It's easy to do. How? Simply click here to return to Cold brew coffee.